Material Capabilities: Aluminum, bronze, copper, brass etc. Third Part Inspection is witnessed by BV. Sr.No./Supplier Code/Item Code/Material Grade & Material HeatNo.,Heat Treatment LotNo. It is taken from the location of poduct for mechanical&chemical test. 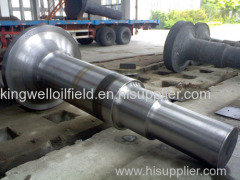 Xi'an Kingwell Oilfield Machinery Co.,Ltdis a highly reputable supplier for oilfield equipment and services toOil & Gas industries and provide complete solutions. With over 10 years developing, we were developed from the beginning drilling service supplier to amanufacture who have own factory and specially produce stabilizer, forgings, BOP & spare parts and DSTtools products. We have experienced team, stronger enough to meet any challenge, we do believe honest is the base ofbusiness and cooperation; our aim is to build solid relationship with any part of honest. We can providehighly efficient services to each client resulting in accurate and timely deliveries at the best prices. Wesincerely hope to make cooperation and mutual benefit wih any people who are in Oil & Gas industry. We will be highly appreciated if there is any enquiry from your side, thanks a lot!